Scott? You know that I like the dress design that Jenny's wearing--old fashion design with a lot of class and a hint of contemporary design. However, I'm confused as to why there's a red triangle on the back? whitepony wrote: Scott? You know that I like the dress design that Jenny's wearing--old fashion design with a lot of class and a hint of contemporary design. However, I'm confused as to why there's a red triangle on the back? It's not a triangle. It's the logo of her airfield, Bali Hai Aviation. Nope not a dumb question. Just a subtle design influence. Nebulous is right. 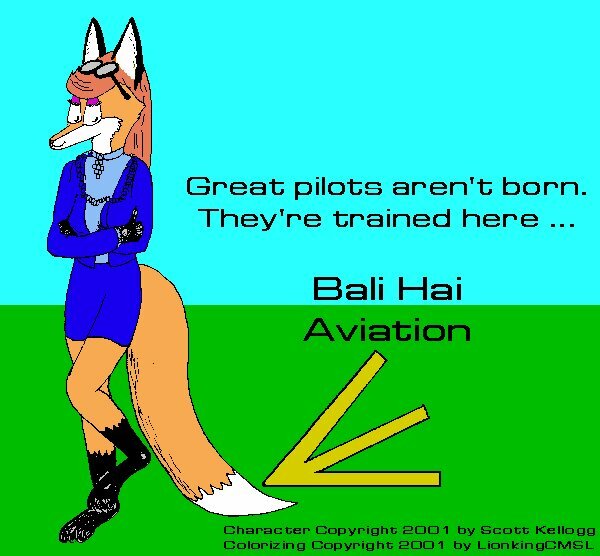 It's the logo of Bali Hai Aviation. come up in the story, but they're there to help explain a few things. Anyway, that ought to answer a few things and a half. afterward to start Bali Hai Aviation. Since the 'Space has blarged today, those of you who don't have the hi-rez site bookmarked (such as myself; Scott had to point me towards the URL) can go here: http://www.hirezfox.com/21cf/index.html to see what everyone is talking about. Knowing the forum regulars here, though, you've all no doubt got that site bookmarked, and therefore have seen the strip already. Scott, I really like how you have Jenny's head turning in the second panel. These sorts of "non-standard" positions are the sorts of things that I'm only figuring out how to do, myself. Excellent job! Okay, gotcha...but why would Jenny wear a Logo on such a beautiful outfit? "We're the Fashion Police...you're under arrest." Um...any chance of you drawing a family reunion at the old homestead??? Making Environmental Education Fun AND Magical! Am I correct that Jenny is wearing a white ruffle blouse under a blue jacket? Looking at the 1/22 image on http://www.hirezfox.com/21cf/index.html , I don't think so. Galore however is definitely wearing a ruffled blouse under her jacket. In the second panel of January 22nd, of Scott's "21st Century Fox," I noticed what appears to be her white blouse tucked into her skirt and the bottom edge of her blue jacket over-lapping her blue skirt. If this is correct, in showing Jenny wearing a blue jacket over her white blouse, then she has an excellent tailor. I hope no-one is offended in any way--I mean no disrespect at all. I just noted that Scott might like to see an alternative to her beautiful blue outfit design. I was spending some time going back and looking through the High Rez versions of Scott's "21st Century Fox" strips and discovered that Jenny is actually wearing a piece of jewelry around her neck. Example: the third and fourth panel of December 27, 2002. I was mistaken and thought the jewelry were ruffles on her white blouse. Oops, my bad. So it might be possible that what I thought was a high collar, white blouse with ruffles (no potato chip jokes please ) may actually be a high collar, turtle neck shirt under her blue jacket. Hmmm...now the question is what kind of jewelry is she wearing? whitepony wrote: I was spending some time going back and looking through the High Rez versions of Scott's "21st Century Fox" strips and discovered that Jenny is actually wearing a piece of jewelry around her neck. Example: the third and fourth panel of December 27, 2002. I was mistaken and thought the jewelry were ruffles on her white blouse. Oops, my bad. So it might be possible that what I thought was a high collar, white blouse with ruffles (no potato chip jokes please ) may actually be a high collar, turtle neck shirt under her blue jacket. Hmmm...now the question is what kind of jewelry is she wearing? Is there a closeup drawing of Jenny's diamond necklace? Nearly all of Scott's drawing of her necklace just show a series of round circles connected in a one, two, three, two, one design; starting from the collar down. I'm now under the impression that the diamonds are compressed flat wafers. If so, they're rather fascinating diamonds and would be a challenge to draw. Ahha! Scott does have a backup site somewhere, I don't have the url on this machine though. Anyone got it handy??? There may/not be some artwork there as well...? blouse under her flight jacket. but I don't think I did a very good job of it detail wise. tends to wear a lei when she can get them delivered fresh. gets her fashion advice from Beth, who has rather regal tastes. figured out how it's held together. Kellogg wrote: Jenny normally wears a white, high collared (somewhat Victorian) blouse under her flight jacket. LOL...I understand that very well. Now here is where it gets difficult to understand the design. and one in the last bottom row. Are the other three in the collar around her neck? I spent nearly an hour searching the internet, trying to find a flat, round, double conical diamond. I'm not sure I'm visualizing it correctly. Is there a reference picture somewhere out there? I think I may have figured out the flexible joint connections between the one inch mounting brackets that would hold each diamond. I can't count. There are 9. I spent nearly an hour searching the internet, trying to find a flat, round, double conical diamond. I'm not sure I'm visualizing it correctly. Is there a reference picture somewhere out there? many there are in a normal diamond. whitepony wrote: I spent nearly an hour searching the internet, trying to find a flat, round, double conical diamond. I'm not sure I'm visualizing it correctly. Is there a reference picture somewhere out there? I did find one cut called the "Princess" cut that was beautiful in appearance. Drawing that would be really difficult though. whitepony wrote: I did find one cut called the "Princess" cut that was beautiful in appearance. Drawing that would be really difficult though. There is an article in the current (February 03) Scientific American that details the manufacturing processes of synthetic diamonds, and discusses the propietary technique used by a company called Debeers. There are some images, but better diamond imagery is to be found on the 'Net. (2) Natural diamonds have a diamond-shaped crystal structure; synthetic ones have a square crystal structure. These statements cannot both be true. I am still jamming on other matters, but will look into this later.